No doubt that hair loss is one of the most upsetting things that could happen in a person’s life. People who suffer from severe fast hair loss look way older than those with the same age with no hair loss. This could cause depression and lack of self-confidence. That’s because they think having hair equals beauty, youth and self-confidence. In such cases people should seek the best solution and the only permanent one is hair transplant surgery. No one can deny the inseparable relation between hair and beauty. Nevertheless, there are some factors, including heredity, hormone imbalance, radio therapy, and etc. that cause hair loss. With today’s highly skillful Iranian surgeons, performing numerous cosmetic and medical surgeries with a significant rate of success, there is no need to worry for those who want to enjoy a more pleasing look with attractive hair. You once again have the opportunity to enjoy a full head of permanent hair, at an incredibly low price.In fact, Iran is one of the leading country in the world for hair transplants. irpersiatour as an Iranian medical tourism provider could help you to connect to the best hair transplant clinics. It’s a type of surgery that moves hair you already have to fill an area with thin or no hair. Doctors have been doing these transplants in the U.S. since the 1950 s, but techniques have changed a lot in recent years. Hair transplant is a common surgical procedure performed to obtain this goal, that is to fill areas with thin or no hair. Simply put, hair follicles are moved from a part of the body, called “donor site”, to a bald or balding part, called “recipient site”. Mainly it treats male pattern baldness, and it also can be applied for beard, mustache, and eyebrow transplant. There are three main techniques for performing hair transplant. They include Follicular Isolation Technique (FIT), Follicular Unit Extraction (FUE), and Follicular Unit Transplantation (FUT) also known as Follicular Unit Strip Surgery (FUSS). You usually have the procedure in the doctor’s office. First, the surgeon cleans your scalp and injects medicine to numb the back of your head. Your doctor will choose one of two methods for the transplant: follicular unit strip surgery (FUSS) or follicular unit extraction (FUE). Why hair transplant in Iran ? Low cost of this surgery and qualified expert physicians are two major reasons for this choice. 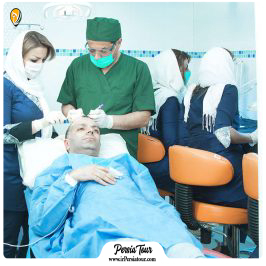 Hair transplant is a common cosmetic procedure in Iran. With highly-experienced hair transplant surgeons and state-of-the-art technologies used in hospitals and cosmetic clinics across the country (largely based in major cities such as Tehran, Mashhad, Shiraz, Tabriz, Isfahan, Kish, etc.) coupled with affordable prices and quality medical tourism services, Iran is prepared to offer foreign hair transplant candidates a very enjoyable experience of hair restoration treatment. We at irpersiatour are doing our best to assist you with planning a trip to Iran and get an effective hair transplant at the most reasonable price. The cost of a hair transplant procedure in Iran is one of the lowest, if not the lowest, in the world among countries that offer high-quality procedures as well as other health tourism services. The low cost of hair transplant in Iran serves as another strong incentive, motivating candidates from all over the world to choose Iran as their destination. As is the case with lots of other cosmetic treatments and surgeries, the costs of hair transplant, compared to most countries both in the Middle East region and in other parts of the world, are considerably more reasonable. The approximate FUT and FUE hair transplant cost in Iran would amount to $1,000 to 1,500, while the same procedures in the United States cost much higher, $6,000 to $16,000. The average hair transplant price in Europe can range from $4,000 to $16,000. Hair transplant is without anesthesia but with local anesthesia and the person undergoing this surgery would not feel any pain on head while hairs are being transplanted. Hair transplant in Iran is conducted in different ways but in all of them natural viable hair is transplanted. Iranian physicians have a lot of experience in this field because there are a large number of volunteers for hair transplantation. Every year a lot of Europeans come to Iran to undergo this surgery. After that point, both procedures are the same. After he prepares the grafts, the surgeon cleans and numbs the area where the hair will go, creates holes or slits with a scalpel or needle, and delicately places each graft in one of the holes. He’ll probably get help from other team members to plant the grafts, too. نعم ، نحن ندير أطباء في الشركة ، والتي يمك استشارتها مجانًا. Can Americans get Iranian visa ? Visa procedures have been considerably simplified during recent years. All nationalities except Israelis are allowed to apply. All American tourists who want visit Iran will need to join a tour to Iran. The visa process can take up to 30 days, so tourists should finish planning their travel at least 60 days ahead of time. do u have any package ??? Yes, you can see All packages in Medical Packages page. And you can ask our medical advisor any questions with +989392860035 . How long will it take about 1,000 graft to plant?